Caparo Vehicle Technologies (CVT), formerly known as Freestream, is a British company that provides advanced technology development, materials engineering, and design services to automotive, motorsport and aerospace markets. The company was o founded under the name Freestream by Graham Halstead and Ben Scott-Geddes, former engineers that worked on the McLaren F1 project. In April 2006, the company was acquired by Caparo, and renamed Caparo Vehicle Technologies. 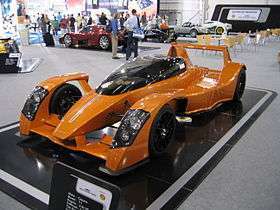 Caparo Vehicle Technologies produces a sports car called the T1. ↑ "Caparo Vehicle Technologies". Retrieved 2007-11-24. ↑ "Freestream T1 Roadster: Less Is More". businessweek.com. February 7, 2006. Archived from the original on 22 May 2011. Retrieved 4 January 2011.